The Vava Sous Vide VA-EB016 is best suited for someone who will only be using a sous vide ocasionally or is shopping on a budget and needs a value priced model. $59.99 Current Price - YOU SAVE 15% - This is the lowest price for this item. The Vava Sous Vide VA-EB016 is one of the value priced sous vide cookers we reviewed. It's not as high quality as most of the other models we reviewed, however it does come at a lower price. 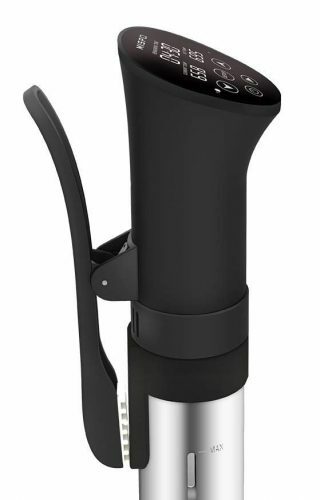 This makes it best suited for occasional use or for someone who wants to try sous vide cooking without making a big investment. The Vava Sous Vide is $59.99 , compared to our second highest rated model the Wancle Sous Vide SVC001 for $87.99 which we feel is a much better value. This model is 14" in height which makes this model smaller than the average of all the models we reviewed. it has a standard strength housing and a stainless steel tube housing for the heating unit. It has an alligator style clamp, which is easy to set-up and cleanup and put away, but it doesn't off a lot of flexibility for vertical adjustment. If you're shopping on a budget or don't plan to do, a lot of sous vide cooking you should consider this model. If you are a serious home chef you should pass on this model. For just slightly more money you can get our second highest rated model the Wancle Sous Vide SVC001 which is a much better value. We recommend the Wancle Sous Vide SVC001 instead. 14" x 5" x 2" 11.1" x 14.8" x 4.5" 16" x 3.5" x 3.5"
The Vava Sous Vide VA-EB016 is a sous vide cooker that's best suited for someone who will only be using it occasionally or is shopping on a budget and needs a value priced model.